Habitat: Large-leaved Linden is native to Europe. The plant prefers lime-rich soils. 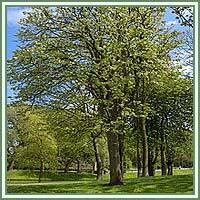 Description: Large-leaved Linden is a deciduous tree, growing up to 40m in height. It has a reddish-brown stem when young and a finely fissured, dark grey bark, as it matures. Large-leaved linden has wide and upward branches, red-green twigs and simple, alternately arranged leaves. The leaves are ovate to cordate, sharply serrated and green in color, with white hairs on their underside. The flowers appear in drooping clusters in groups of three to four. They are small and yellow. The fruit is a small and beige spherical nutlet. Useful components: Flavonoids, glycosides, volatile oil, tannins. 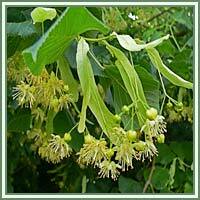 Medicinal use: Large-leaved Linden is considered to be a diaphoretic, diuretic, antispasmodic, sedative.Traditionally, plant was used as a diaphoretic to promote perspiration, and as a sedative in cases of anxiety, anxiety-related indigestion, hysteria and heart palpitations. Linden flowers are most commonly used in treatments of colds, coughs, fever, flu, sore throat, various infections and inflammations, high blood pressure, headaches and even epilepsy. Leaves can be used to improve perspiration and reduce fever. The bark is said to be helpful in treatment of gallbladder disorders and cellulitis. It can also soothe skin irritations, boils, burns, wounds and sores.